Signage has been up in the windows of this long-empty storefront on Avenue B between Third Street and Fourth Street for a "Going out of Clintness Super Sale!!!" Their respective Instagram accounts say that the one-day sale happens tomorrow (Saturday!) Not sure what might be for sale. Maybe Valentine's Day cards? 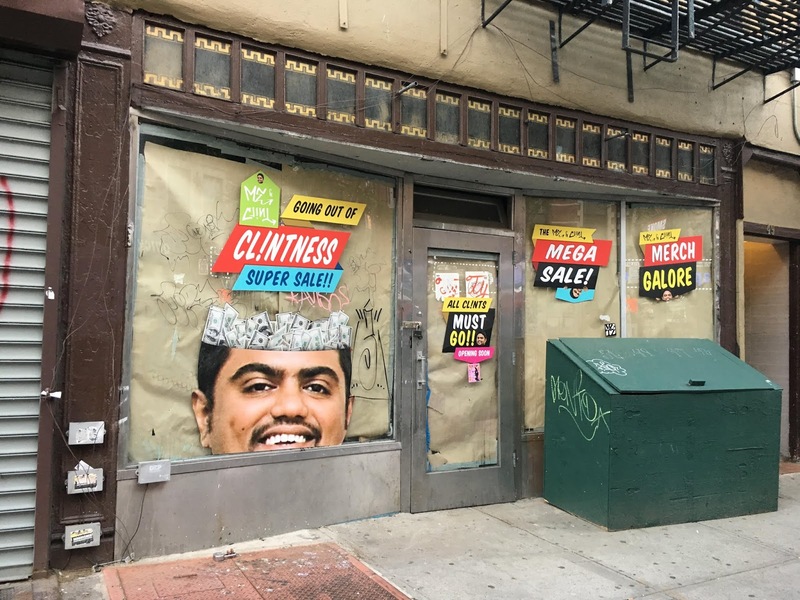 For well over a year, the mostly-anonymous prankster-artists have been working together on an epic scale in their execution of a prolific branding campaign centered around the smiling mystery persona Clint Mario. Armed with keys to the ad kiosks at bus shelters and payphones, the two-person team is responsible for pulling off dozens of takeovers with the audacity of an outdoor advertising company, replacing paid ads with lowbrow parodies lampooning various brands, products, and movies. The pop-up shop is on Orchard Street!